Caleb focuses his practice on criminal and civil trials, and all types of appeals. A native of Tyler, Texas, Caleb relocated to Jacksonville after college and has resided in Jacksonville since 2004. 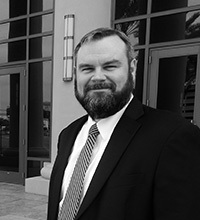 Caleb graduated from the University of Mississippi in 2002, and attended Florida Coastal School of Law, where he earned numerous book awards and was recognized for academic excellence. After law school, Caleb practiced with The Schwartz Law Group, P.A. for several years before partnering with William Blume and creating Rowland Law Firm, LLC in 2014. Throughout his career, Caleb has achieved favorable outcomes for a multitude of clients under diverse circumstances. He firmly believes the court's role is to uphold absolute fairness, search for truth, and provide justice.